Here is a starter kit that will allow you to realize the true potential of your oscillating multi-tool. As with every project, the right tool is needed to get the job done, with this accessory kit your oscillating tool will be ready to take on any job around the house. Purchased individually, these accessories would cost so much more. 1 each - 10mm (3/8') fine tooth stainless steel quick cut saw blade. 1 each - 20mm (3/4") fine tooth stainless steel quick cut saw blade. 1 each - 35mm (1-3/16") fine tooth stainless steel quick cut saw blade. ATTENTION, SALE IN EFFECT. 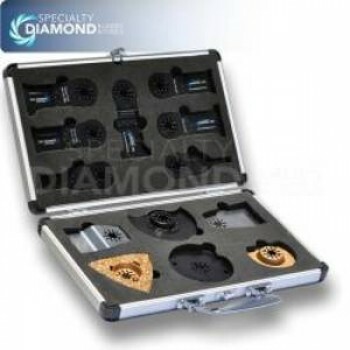 THIS BLADE KIT IS BEING SOLD WITHOUT CASE AT A SPECIAL DISCOUNTED PRICE. This is an excellent multifunction power tool combination blade kit for those who want to experience the versatility of their oscillating tool on various projects. This kit is highly recommended for professional handymen or hobbyist. ATTENTION: SALE IN EFFECT. THIS BLADE KIT IS BEING SOLD WITHOUT CASE AT A SPECIAL DISCOUNTED PRICE. ATTENTION: NO CASE FOR BLADES. (Non lmperiaI Blade Product. Imported from overseas).